Through the last 7 years I have performed as a beatboxer / Vocal Percussionist with vocal groups and choirs, as well as given workshops on technique and musicianship. In March 2015 I visited Faaborgegnens Efterskole and Ollerup Efterskole together with UFO / Kristian Humaidan. 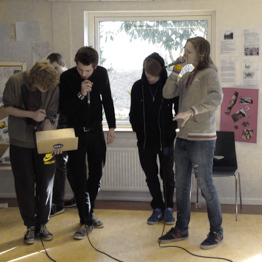 Together we did a combined workshop, teaching beatbox and rapping/writing.